The Canterbury Charity Hospital Trust was established by the community, for the community in 2007. Over the years many doctors, nurses, dentists, health professionals and public-spirited people have volunteered their time and expertise to help make the charity hospital a success and enable us to provide our services for free. Our patients come from throughout Canterbury within the Canterbury DHB area. We do not receive any Government funding and rely on donations, grants and the generosity of the wider community to continue helping Cantabrians in need. The East wing of the hospital was opened in 2007 to provide day surgery facilities and medical clinics. Due to the changing needs of the Canterbury community following the 2010/11 earthquakes, a new two storey and larger West wing was added to provide additional theatre space, an endoscopy unit, a dental unit, more consulting rooms and educational/research facilities. Many people in the community help with the day-to-day running of the hospital. Together, we can all make a huge difference to the health and wellbeing of our community as a whole. Mr Philip Bagshaw, a general surgeon, recognised the need for a charity hospital when he realised that no government would be able to meet all the needs in healthcare. There are hundreds of professional staff involved with the day to day running of the Trust and they are managed and supported by a small clinical management team. Welcome to our new Trustees. 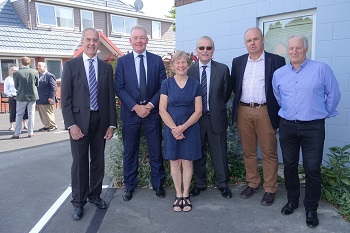 Pictured (left to right) at the recent opening of the hospital’s new Oral Surgery are Peter Cook, Richard Smith, Sue Bagshaw, Philip Bagshaw, Frank Frizelle and Peter Pryor.